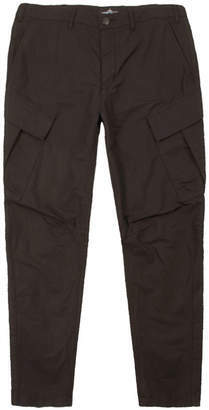 Stone Island Shadow Projects Cargo Trousers in Black. Demonstrating the sub-brand's dedication to both form and function, these tapered cargo pants are crafted in Italy from a lightweight cotton-linen mix that's perfect for the warmer months. Boasting elasticated articulation tunnels to the rear of the legs for a customisable fit, the pants feature large snap pockets to the sides for all your daily essentials.